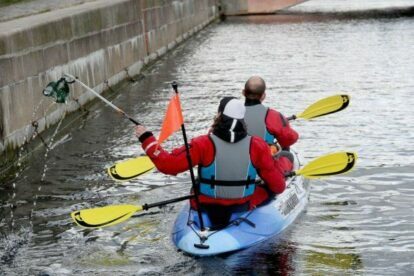 Miljøkajakken or The Environment Kayak in good old English, is, from my perspective, one of the best initiatives in Copenhagen in a long time. We pride ourselves with having some of the cleanest seawater in the world and being able to swim around the channels of Copenhagen. But sometimes people just can’t hit the trashcan and hit the sea instead. This kayak is a free way of sailing around wonderful Copenhagen, seeing the fairy tale city from a whole new perspective. You and a friend can paddle around in your own tempo and soak up the sun — for free, as long as you commit to collecting the trash you sail by. It’s the best of both worlds – you get to go on the water and have fun, while you make a positive impact on the beautiful city a lot of us call home. It’s ecotourism taken to another level. You have the kayak for 2 hours, so you have plenty of time to enjoy your trip around Copenhagen. In 2017, more than 800 people collected around 3.5 tons of trash on the little floater – let’s see if we can beat that in 2018. Do note that this kayak has been a major success and it is very popular. Book well in advance if you want to try it. If you are short on time, you can rent a “regular” kayak against a fee at Kayak Republic – the same place that houses The Environment Kayak.